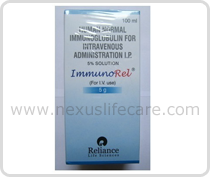 Immunoglobulin Injection distributors, dealers & suppliers in Mumbai. Uses:- Immunoglobulin injection (also called gamma globulin or immune globulin) is a substance made from human blood plasma. The plasma, processed from donated human blood, contains antibodies that protect the body against diseases. When you are given an Immunoglobulin injection, your body uses antibodies from other people's blood plasma to help prevent illness. And even though Immunoglobulin injection are obtained from blood, they are purified so that they can't pass on diseases to the person who receives them. Specific types of Immunoglobulin injection are made to protect against specific diseases, such as hepatitis, chickenpox, or measles. •	Give short-term protection against or reduce the severity of certain diseases. •	Protect your fetus if you are pregnant and at risk for Rh sensitization. •	Decrease the immune system's ability to attack body tissues in some cases of autoimmune disease. •	Help people who have an inherited problem making their own antibodies or those who are having treatment for certain types ofcancer (such as leukemia).